You're less than three months away from turning three, but I guess we're already thinking of you as a three year old. We've started buying some 3-4 year old sized clothing, as a few pairs of well-worn trousers and a couple of jumpers were starting to come up short, although your new clothes need some rolling up for now - and a belt too! You're also now wearing size 7 shoes - there's still a little wear left in your other pairs but we're just starting to make the transition. At the weekend, you had your hair cut. You really needed it, although Daddy and I don't really know what kind of hairstyle you're going to have as your hairline still needs to grow in a bit more. You sat very well at the barbers, although you had to still sit on Daddy's lap, and you kept asking where your hair had gone afterwards, saying "put it back!". You're looking tall, measuring around 91cm, and so much more like a little boy. 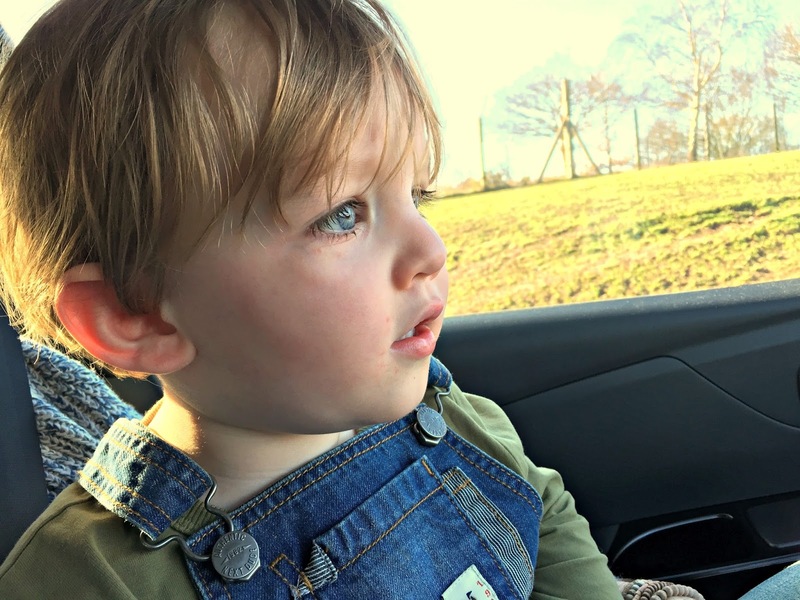 Your expressions are much more grown up and you've started mimicking Mummy we think; when you concentrate, you pop your tongue out the corner of your mouth and you've started frowning, pursing your lips in a comical way whilst placing your hands on your hips. It's so, so funny! You ask questions about everything, you're starting to learn what 'why' means and you give us a running commentary of your favourite films. Toy Story is still your favourite, and all the others are still regulars too, including Monsters Inc, Frozen, Lion King etc. You've also discovered pirates. Which has made Daddy very happy. There's a pirates animated film you love and Muppets Treasure Island has been on repeat these past couple of weeks. You enjoyed dressing up like a pirate when you had a day with Daddy and you've been riding your dinosaur rocking horse shouting "yo ho, yo ho - pirate's life for me!". Your routine is much the same as before - waking up during the week around 7.15am, when I come to get you ready for nursery, enjoying lots of fun there with your friends, coming home at 6pm to play and steal some of Mummy's dinner before bath time, book time and falling asleep around 8,30/9pm, with Mummy and Daddy taking turns at bed time. All the usual favourite reads are still frequently read, and more often than not you say "I see it" as you want to follow the story. You love We're Going On A Bear Hunt, which you've read at nursery, so we bought it for you and took you to see a live performance of it, but soon you started getting a bit scared when we read it to you so we've put it away for now. You can say and understand so many things. You're very observant, asking questions like "Daddy, where's your shoes and socks gone? ", "Daddy beard fell off, it's lost, put it back" and "Ethan's porridge, Daddy's porridge... but where's Mummy's porridge? She not got it?". You've been practising recognising your colours and can sing 'I can sing a rainbow'. You dance, sometimes in the bath, shaking your toosh and saying "wiggle wiggle!". Since the start of the year, we've had lots of time together at home. We've been to the safari park, we've made some cakes and cookies and we've celebrated Daddy's birthday. You run the show pretty much, telling us what you want to do, showing us what you want, telling us what you see and negotiating with us when we say it's bed time, by saying "two minutes!". Sometimes you say three minutes, but you can't hold your fingers up in that way and you ask Mummy to show you and help you do it. You still can't put your thumbs up, either, instead using your two first fingers. You've also started doing this hand gesture, where you push your palm in our direction a couple of times, trying to get our attention. You're affectionate, stroking Watson, letting the cats 'boop' your finger with their noses and telling your cuddly toys that they are your best friends. You also occasional come out with the 'I' (pointing to your eye) 'love' (pointing to your heart) 'you' (pointing at Mummy), which just makes my heart want to burst. I say it every time, but you are just wonderful. To watch, to play with, to talk to. Wonderful you. Just two, but not for very much longer. You can read all my past letters to Ethan here. Love his new haircut - he looks so grown up!